DARPA in collaboration with Boston Dynamics has been brewing up some really awesome legged robot technology over the past few years. The various legged robot projects have been under constant update and improvement over the years. 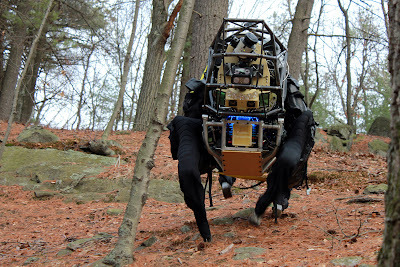 The list of the state of the art legged robots from Boston Dynamics includes the The Big Dog, Cheetah, Petman and the latest of the pack, the LS3. Each robots have been designed for a own unique purpose and have significant differences. The latest updates however are from the Cheetah and the LS3. 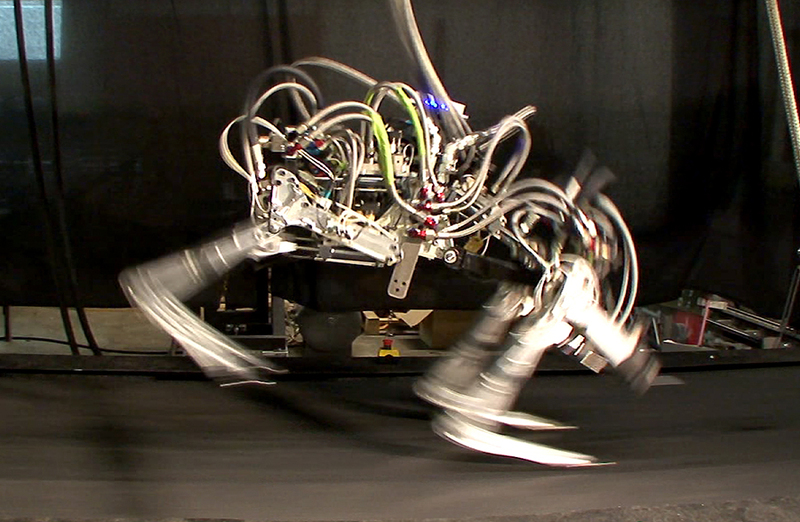 The Cheetah has been under development since 1989 under MIT and later under Boston Dynamics. It has been developed and funded under DARPA's Maximum Mobility and Manipulation (M3) program. A recent video update on YouTube shows The Cheetah running at 28.3 mph (45.5 km/h), breaking it previous record of 27.78 mph (44.7 km/h) which it achieved back in 2009. This makes it 0.5 mph faster than Usain Bolt. Now that being said, The Cheetah has a lot of advantages over Usain Bolt, It runs on a high speed treadmill; plus, it is powered by an off board hydraulic pump and uses a boom-like device to keep it running in the center of the treadmill. Overall, significant improvements for the speeds have been made in the algorithms and a more powerful pump have been added. Although Boston Dynamics plans to test a free running Cheetah in the open environment by next year. Not much details about the technology have been made public. The LS3 is like the improved younger brother of the Big Dog. Its looks much more ready than the Cheetah project. The project is an outcome of contribution of some of the most reputed team of Engineers and Scientists from various centres of technology which includes Boston Dynamics, the Jet Propulsion Laboratory, Bell Helicopter, AAI Corporation, Carnegie Mellon and Woodward HRT. The Biggest capability of this robot is that its all terrain. It could just go about anywhere a solider can. It is an autonomous system and interprets verbal and visual commands which is a big leap. Its actually designed to follow a solider and carry gear and equipment to unburden the solider. It can carry upto 400lbs of weight and reach walking speeds ranging from 1mph to 7mph (1.6 kmph to 11.3 kmph), depending on the terrain. It can carry enough fuel of go for 20 miles and stay up for 24hours. All that being said these robot represent the paramount of legged robot technology and have been developed to help solider to have a significant advantage over the enemy in any terrain.